The most appropriate position for a garden is the area with at least 6 hours continuous sunlight. The rows should run east to west to get optimum sunlight. 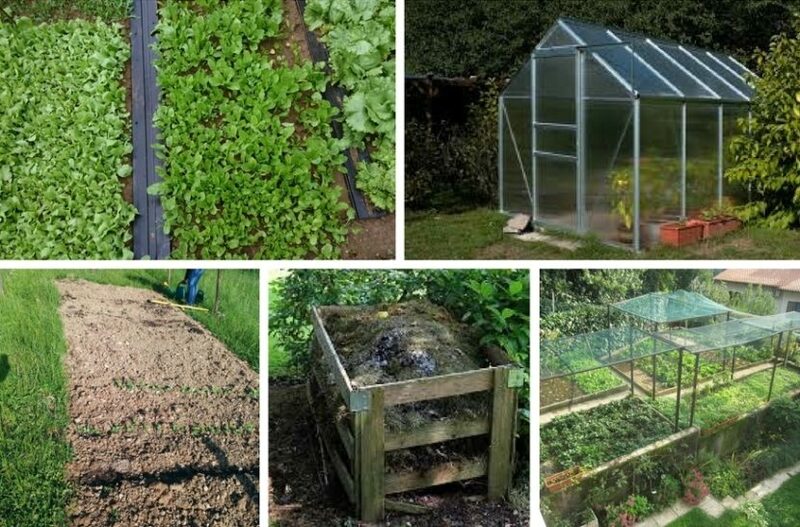 The size of the garden should be appropriate according to your abilities and needs. A 30 m2 (100 ft2) garden supplies a family of four with fresh vegetables. A 60 m2 (200 ft2) provides food for a whole year. A 100 m2 (300 ft2) is enough to plant potatoes, asparagus and similar. If you want to turn a meadow into a garden, do it during fall or spring, remove the roots of grass and other plants and any stones. Prepare a space for compost in a shady area not to near to the garden. The width of the garden beds should enable cultivating from the side/path – approx. 1.2 to 1.5 m (3 to 4 ft). The paths between beds should be at least 40 cm (1 ft) wide. Don’t use wooden boards for paths, as slugs will hide underneath. Birds, hedgehogs, ladybugs and other natural predators are very welcome in the garden. It is not good to keep chicken in the garden as they eat earthworms. Marigolds, calendula and Indian cress is good for the garden as well – they help with fungal diseases and repel pests. To repel slugs, plant onion, garlic, white mustard, Indian cress, calendula, sage or thyme and make an elder or forest fern mulch. Organic matter has to be replaced in the soil; therefore it is best to compost garden waste and use it again. If you don’t know the characteristics of your soil, take it for analysis to your local agriculture and forestry organizations. The soil has to contain the proper acidity, the proper amount of organic matter, nitrogen, phosphorus and other micro- and macro elements. The fruit area that you will spray should be far away from the vegetable garden. Make sure that fruit trees don’t make a shadow for vegetables. Garlic and onion repel mice and voles from the tree root. Lamb’s lettuce and spinach repel ants which bring lice to the fruit trees. Raspberries grow well with beans and peas, but beans must not be planted in the same area every year. It is recommended to plant herbs near fruit trees.